May 17, 2017 —The Mamoru and Aiko Takitani Foundation, Inc. has awarded $181,000 in scholarships to 62 exceptional seniors from every qualifying public and independent high school in Hawai‘i as part of its Legacy Scholarship Program. Three students were recognized with scholarship awards totaling $28,000. Two students received Outstanding Student Awards of $10,000 each and one student received a Distinguished Student Award of $8,000. Two students received Director’s Awards of $6,000 each. Nine high school seniors received $5,000 scholarships as district finalists and 48 students were awarded $2,000 scholarships. Nominated by their respective schools, the award winners received scholarships based on their strong academic achievement, dedicated community service and financial need. • Joseph Kim of Maui High School was awarded the Mamoru Takitani Outstanding Student Award of $10,000 and will attend Columbia University in New York this Fall. He is the son of Sung Yun and Kyung Sook Kim. 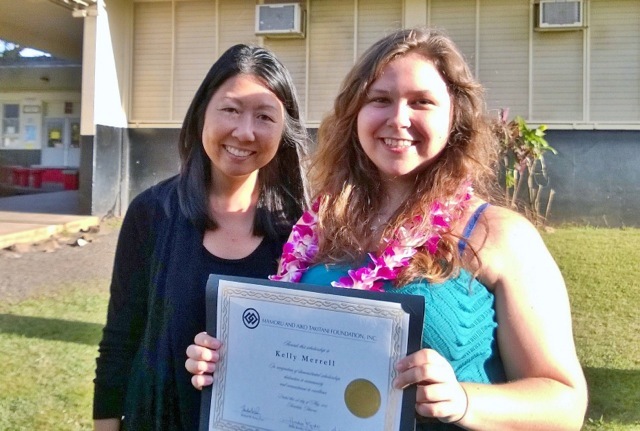 • Leilani Chelliah of Kaimuki High School received the Aiko Takitani Outstanding Student Award of $10,000. Chelliah is the daughter of Anton Chelliah and will enroll at the University of Hawai‘i at Manoa in the Fall. • Lexie Leon of Maui Preparatory Academy was the recipient of the Karen Uno Distinguished Student Award of $8,000 and plans to attend Nova Southeastern University in Florida in the Fall. Leon is the daughter of Richard and Valerie Leon. 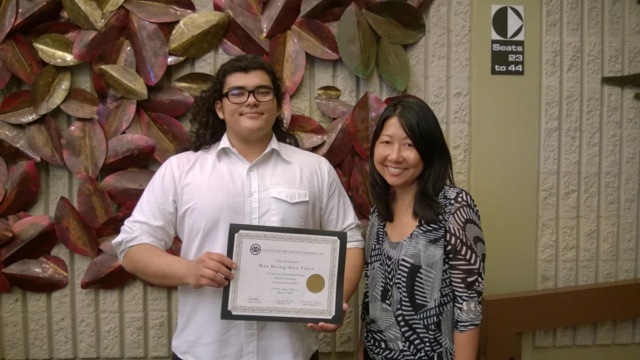 • Rudyjay Keopuhiwa, Jr. of Waianae High School received the Mildred Higashi Directors’ Award of $6,000. He is the son of Rudyjay and Malia Keopuhiwa and will enroll at Whitworth University in Washington in the Fall. • Taryn Wong of Sacred Hearts Academy was the recipient of the Directors’ Award of $6,000. Wong is the daughter of Brian and Lisa Wong and will enroll at Johns Hopkins University in Maryland in the Fall. • Alyssa Lau of President Theodore Roosevelt High School. She is the daughter of Man Fai Lau and Ruixian Liao. • Pomaikai Canaday of Leilehua High School. She is the daughter of Thomas and Edlene Canaday. • Michael Caris Abagon of Mililani High School. He is the son of Michael Anthony and Cristina Abagon. • Reina Mitsuda of James Campbell High School. She is the daughter of Rie Grow. • Branda Chen of Kalaheo High School. She is the daughter of rank Chen and Diann Lee. • Chloe Gan of Ka`u High School. She is the daughter of Thomas and Mary Sugrue. • Sharay Rapozo of Waimea High School. She is the daughter of Roy and Shasta Rapozo. • Tanner Riley of Hawai‘i Preparatory Academy. He is the son of Bryan and Tara Riley. • Marcus Eugenio-Mendoza of Saint Louis School. His guardian is Fe Cardenas. • Honolulu District: Jacynth Tate Agraan of Gov. Wallace Rider Farrington High School; Micah Mew of Henry J. Kaiser High School; Emily Yang of Kalani High School; Leo Wu of President William McKinley High School and Arden Patoc of University Laboratory School. • Central O`ahu District: Nicole Arca of `Aiea High School; Jasmine Loo of Moanalua High School; Eugene Tunac of Admiral Arthur W. Radford High School and Saige-Caleigh Dayacos of Waialua High and Intermediate School. • Leeward O`ahu District: Alexandria Borges of Kapolei High School; Joey Pantil of Nanakuli High & Intermediate School; Alex Yamada of Pearl City High School and Rhonaleih Joy Sao of Waipahu High School. • Windward O`ahu District: Serena Castleberry of James B. Castle High School; Zamic Sullivan of Kahuku High & Intermediate School and Max Arakaki of Kailua High School. • Hawai’i District: Leilahi Pupuhi of Honoka`a High & Intermediate School; Chayna Yoshida of Kea‘au High School; Gabrielle Tabbada of Kealakehe High School; Cosette Daniels of Pahoa High & Intermediate School and Kiaria Zoi Nakamura of Waiakea High School. • Maui District: Katelynn Oliveira of Hana High School; Katie Yoshioka of Henry Perrine Baldwin High School; Erica Sawczynec of Kihei Charter School; Alexus Yoro of King Kekaulike High School; Ian Paul Viloria of Lana‘i High & Elementary School and Sonja Angst of Moloka‘i High School. • Kaua`i District: Jayson Hawthorne of Kapa‘a High School and Sydney Brady of Kaua‘i High School. • Hawai`i Association of Independent Schools (HAIS): Kelsey Ikeda of Assets School; Tarah Kuhn of Hanalani Schools; Lauren Lee of Hawai’i Baptist Academy; Cierra Nakamura of ‘Iolani School; Mark York of Island Pacific Academy; Carolyn Price of Island School; Naneaikealaula Thomas of Kamehameha Schools Hawai‘i; Vance Farrant of Kamehmeha Schools Kapalama; Dorian Raboy-McGowan of Kamehameha Schools Maui; Alexandra Araki of La Pietra Hawai’i School for Girls; Miah Tapper of Le Jardin Academy; Kerri-Ann Kamei of Mid-Pacific Institute; Darien Jones of Parker School; Brent Shimoda of Punahou School; Milena LaMonica of Seabury Hall and Kaitlyn King of St. Andrew’s Schools, The Priory. • Hawai`i Catholic Schools (HCS): Keila Lee of Damien Memorial School; Ian Paulo Santiago of Maryknoll School and Shinya Saito of Saint Francis School. Mamoru and Aiko Takitani founded Hawaiian Host, Inc., manufacturer of Hawaiian Host chocolates, and established the Mamoru and Aiko Takitani Foundation, Inc. to give back to the community by providing the gift of education to the young people of Hawaii. Hawaiian Host donates part of the proceeds from the sales of Hawaiian Host products to the Foundation in support of its scholarship programs. Since 1993, the Foundation has annually presented scholarships to an outstanding student from every qualifying high school in the state and has awarded over $2.4 million in scholarships through its programs.